Are You Smarter Than a Shmooper? Ready to test yourself to see if you're smarter than a Shmooper? We've gathered four questions (and answers—you're welcome) from some of our favorite premium online courses and test prep. *Premium account required—24-hour free trial available. This course has been recommended for ACE CREDIT®, which means it is considered for credit at thousands of colleges and universities across the country. For more information, click here. Jim works in an office. He brings in a pan of brownies that his wife made to share with his coworkers. It is Saul's impression that the cookies he usually brings aren't very good, so he works to improve his recipe. Finally, he brings in an awesome batch of over-the-top delicious cookies. This is an example of what? Have a question about the article? 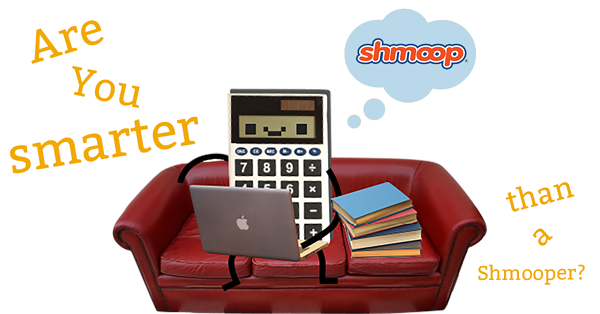 Shmoopers earn college credit for only $87 a month. ** Learn at your own pace. Shmoopers are experts in finance. Courses, guidance, and videos to help you land that job or promotion. All content written by PhD students from Stanford, Harvard, Berkeley, and other top universities. Shmoop is only $24.68 a month with free cancellation anytime. Shmoop offers a 24-hour FREE trial to all new subscribers. For people looking for that low cost, high quality, no hassle, low stress, get-you-ahead-in-life kind of opportunity. *Results may vary. **Not including cost of proctored exams. © 2018 Shmoop University. All rights reserved.